For progressives committed to reasoned debate about public ends—competent democratic government, peace and broadly shared prosperity, an environment that will allow human flourishing in future generations—these are dark times. In international affairs, when one considers the medieval sectarian religious violence of ISIS (but with modern weapons! ); the rising income and political inequality to be found nearly everywhere; our abject failure to arrest species-extinguishing carbon emissions; the private-investor coup of the Trans-Pacific Partnership; a revived Cold War with Russia; and unending air wars on Islamic terrorists that chiefly fuel their recruitment base, there is little trace of an effective progressive presence—or sometimes even sanity. And in national politics, especially in the rich countries of North America and Europe, things seem even worse. There, for a long generation after World War II, social democracy and its Keynesian welfare state secured an uneasy but productive peace between capitalism and democracy. But that peace is no more. The chief reason is that the world it worked in—national economies still relatively insulated from international competitive pressure, led by a limited number of large, functionally centralized and vertically integrated firms, organizing work in stable systems of hierarchical control—is also no more. It’s been replaced by one of much more internationalized and digitalized production, by changing constellations of functionally decentralized and vertically disintegrated firms, drawing from a global labor force that includes billions of workers paid a tiny fraction of what their rich-country counterparts make. 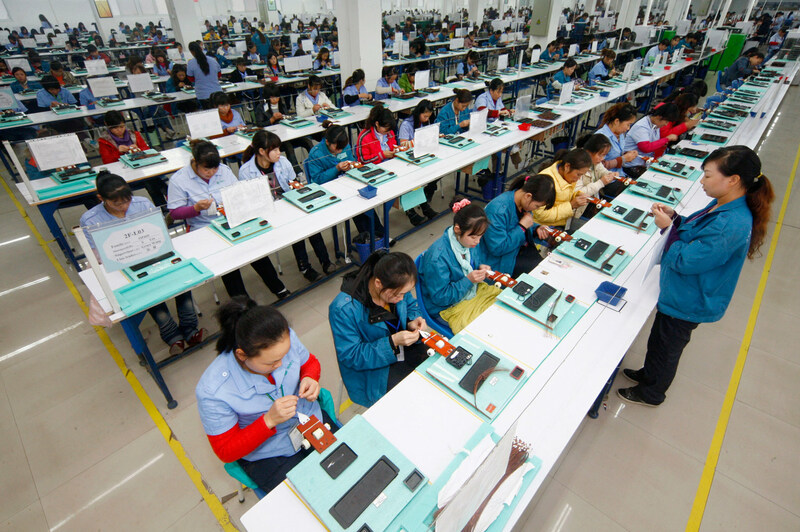 This new world has disrupted labor movements across the globe and eliminated any trace of the home-country loyalty previously displayed by big business. But its greatest casualty has been public confidence in liberal democracy itself. At no time in the past century has that been lower than today. You can’t blame the public for this. Politics has truly failed them. For more than a generation now, virtually every important elected leader has told the same story: “Capital is free to move anywhere. Any tax or regulation we impose on it will be cost, and any cost a spur to its movement elsewhere, which will hurt us all. So while we feel your pain, you must understand that our ability to regulate or tax capital is gone. Get used to it.” That this story ignores some crucial facts—the real-world “stickiness” of much investment; the self-supply of most economies; the dependence of the service sector, which supplies most of the jobs requiring immobile labor; the power of government purchasing to shape private markets; and the obvious fact that many taxes pay for things that capital sorely needs—doesn’t stop its devout repetition. Nor did financial capital’s crashing the world system in 2008. Looking at this sorry history, many have concluded that these times mark not just the end of social democracy, but any plausible egalitarian-democratic project. I think that’s wrong. Traditional social democracy, with big labor, big business and big government bargaining over management of the economy and society, is indeed near death and probably can’t be revived. And I don’t think we should try. Even in its heyday, social democracy was too centralized and top-down in its administration, too socially exclusionist, and too narrowly concerned with class—and it still is. However, an alternative egalitarian and democratic project—one more suited to today’s economy and sensibilities and more uplifting of real freedom and human possibility—is available to us. It offers a natural and very large base, demonstrated proof of effectiveness for most of its policy ingredients, and even furtive properties of “emergence.” What it lacks is not plausibility, but rather its clear articulation as a distinct project in public discussion, party politics and democratic movement-building. Call this project what you will; I call it “productive democracy.” I’ll give reasons later for my optimism about PD’s chances. But first I’ll describe its motivation, ambitions and essential elements, as well as how they cohere into a viable political order. I make no suggestion on the strategy to achieve PD (something we can all discuss later if there’s interest). This is about the land on the other side of the Jordan, not the rowboat across. Doing so is one central aim of productive democracy—and the source of “productive” in its name. Because, along with seeking economic security and opportunity for all, PD would highlight the centrality of fostering both social learning and productivity—understood not just as output per unit of input, but as value per unit of input (and where “natural capital,” a k a the environment, is included in that calculation)—in achieving more ambitious egalitarian ends. It would place a bigger and more visible bet than social democrats ever did on a well-ordered democracy’s ability to help citizens create social wealth—and solve social problems. Its signature politics would be efforts to develop and harness that contribution. Indeed, it would define the “general welfare” not just as physical and economic security and reasonably equal opportunity and life chances, but as the capacity and interest of all citizens to make such contributions, to be actively engaged in building their own society. But so much for ambitions—let’s go to the essential elements. 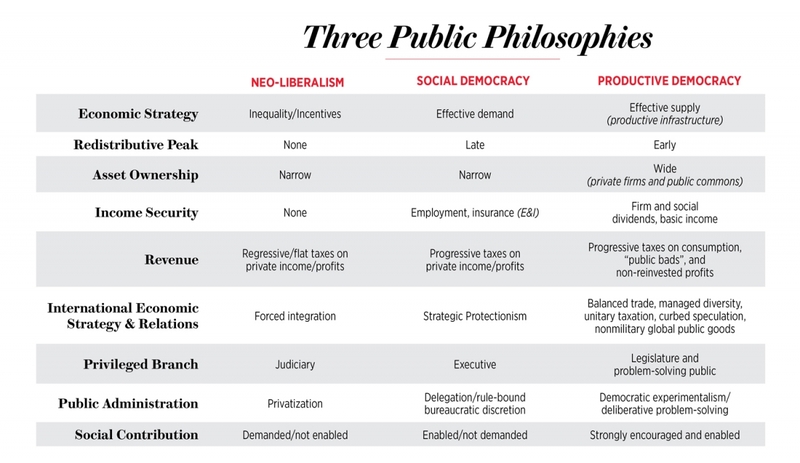 These are summarized in the sidebar “Three Public Philosophies,” which aims to clarify PD’s policy, governing and broad “constitutional political economy” by contrasting its approach with those of neoliberalism and traditional social democracy. Considering, first, policy: in the realm of economic policy, PD would continue to use the traditional Keynesian tools of macroeconomic steering to maintain “effective demand” and keep the economy near its full potential. But it would commit as well to effective supply of the “productive infrastructure” needed to support the economy we actually want, not just the one we have. By this I mean a suite of policies, public goods, and institutions that together work to raise performance standards for firms and communities, enable both to meet them, and capture and share the resulting increased wealth. Already adopted in many cities (but nowhere near all), typical policies include things like standards on job quality, training, career pathways and a living wage at area firms; requirements for reduced waste (eventually zero); and broad encouragement of worker organization and ownership. Typical public goods, with their positive effects in lowering living costs, increasing sustainability and improving the local quality of life, are things like public transportation, education, recreational facilities and public space. Typical institutions are things like regional partnerships (among firm owners, workers and communities) for joint training, credentialing, modernization and marketing efforts; public financing and technical-assistance services to enable meeting higher environmental and other standards; and facilities for planning and citizen engagement and review. We know from experience that providing such productive infrastructure has two salient effects. It increases productivity and wealth in those locations, thereby attracting more private investment. And it grounds that investment (makes it “stickier”), which reduces the frequency and credibility of capital threats to leave town—or the country. This reopens space for social bargaining, even under murderously competitive international conditions. Productive democracy would also argue for increasing the relative share of total “welfare” investment made early in life (everything from early-pregnancy care to perinatal and visiting-nurse assistance to whatever else is needed, up to adulthood, by way of health, education, counseling or other support). While this may be expensive, producing capable and confident adults is still much cheaper than repairing broken ones, and PD’s commitment to equality means preparing all citizens to participate and make a contribution to society. For similar reasons, it would also supplement employment income with a basic income guarantee for all (as most of Latin America does now, and Switzerland and other European countries are seriously considering). And it would vastly widen worker-citizen ownership, both of private firms and society’s “commons.” The latter includes both our natural commons (air, land, water, flora and fauna) and our created one, especially those parts of special benefit to business (e.g., physical infrastructure, intellectual property and business law, central banking). As many have argued, both of these commons should be “monetized,” with beneficiaries charged a user fee, which would be distributed, in whole or in part, to all citizens on an equal per-capita basis. Alaska and Norway have long done this with their oil holdings, and California is now doing something similar with the money paid for carbon permits. But we could—and should—do more. For revenue, PD would make greater use of progressive consumption taxes (for example, with no tax paid up to some reasonable level of consumption, then a sharply progressive rate afterward) and taxes on “public bads” (including pollution, environmental degradation and other socially destructive behaviors). It might also favor steeply progressive taxes on non-reinvested corporate profits. All these means of raising revenue would directly contribute to equity, efficiency and sustainability—even before the money from them is spent. Productive democracy would move government more squarely back into the business of public debate and deliberation. Its “privileged” unit of government would not be those private-property guardians so favored by neoliberals—the judiciary. Nor would it be the executive-centered administrative state favored by social democrats. Rather, it would be the “people’s house,” the legislature—and the organized public itself. In PD’s version of progressive federalism, the national government would establish and fund a set of core commitments to all citizens; state and regional governments would be free to experiment (or not) above that. Preserving its commitment to the affirmative state—the belief that solving problems is the government’s job—PD would promote experimentation and deliberative problem-solving, often involving citizens, in achieving legislatively declared goals. It would ensure and measure accountability by the actual progress toward such declared goals, not by monitoring the observance of often meaningless bureaucratic rules. In sum, PD offers a more open, decentralized, locally rooted, efficient, egalitarian democracy, supported by leaner and more flexible government(s), as joined by a more capable public. Its policies and institutions cohere and mutually support one other in driving up social learning and productivity, visibly benefiting citizens via a better democratic order. It both satisfies democracy’s “survival criterion” and reopens its future. It may not be nirvana, but it’s not too shabby. Why am I optimistic about productive democracy’s political chances? For starters, I think it would be very popular with ordinary citizens, including many now quite hostile to the current affirmative state. Nobody likes stupid bureaucracy. Wider citizen-worker ownership has cross-partisan appeal. Taxes on consumption and “public bads” are more popular than those on income. PD’s basic values—freedom, opportunity, active citizenship, fairness—are nearly universal. Indeed, the only real opponents I see are the hideously selfish and unpatriotic corporate elites and the many public officials who serve them. Those are exactly the opponents that progressives should want. I also think that both the supply and demand conditions for the sorts of democratic collective action that PD calls for are increasingly favorable. On the supply side, technology, of course, can help. Our abilities to confer across distances, and to coordinate, monitor and precisely measure the performance of virtually any inanimate thing, are light-years better and cheaper than they were a generation ago. But more concretely, we are already acquiring the sorts of skills and experience that PD demands. Millions of workers participate daily in multidisciplinary problem-solving teams. Many governments are already breaking down bureaucratic silos, experimenting and measuring progress in policy, and inviting the public to help. New forms of direct citizen engagement in policy are sprouting up all over. The “share” economy of peer-to-peer production and a collaborative commons is exploding. What PD imagines is in the adjacent possible, not the remote. On the demand side, most of the world is moving to cities, so there’s a real need to get those better organized. Climate change is upon us and will require vast amounts of investment and action not possibly supplied by markets. Yet making our cities safer and greener, as well as more just and more resilient, can’t be engineered from any central capital. Both require the local knowledge and commitment of the people actually living there. Finally (and this goes to the question of “base”), nothing I’ve argued for here is remote from humanity’s evident desire. All around the world—a world in which the United States has far less limiting power than in the recent past—billions of people are repelled by the effects of predatory capitalism and would grab at a plausible democratic alternative. For most people, the choice between further degradation and a plausible route to greater security and freedom is an easy one. I think productive democracy offers people that choice. Progressives should put it before them.